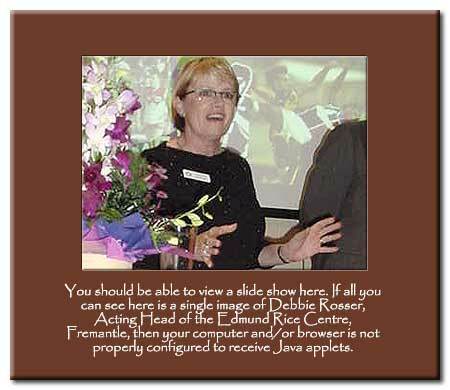 ROUND A HUNDRED INVITED GUESTS including local federal member Carmen Lawrence and mayor Peter Tagliaferri filled to capacity the common room of the former Cleopatra hotel in High St on Friday April 15 at 5.30 pm for the event. Purchase and renovation of the hotel had been largely funded by the Christian Brothers. Chaplain Fr Greg Watson supported by Sr Pauline O'Connor, Br Gerry Faulkner, and Sr Elizabeth Sanders led the prayer. Province Leader Kevin Ryan traced the history of the Centre  speaking appreciatively of those who worked for or in the centre since its 1992 inception. He mentioned specifically Gerry Faulkner, Pat Carey, David Linke, Cheryl Vernon, Peter Harney and Wayne Tinsey and praised the efforts of Debbie Rosser, Claire O'Connor, Shane Lavery and Noelene Trenorden who helped organised the night. He emphasised that the centre was to work with its heart its head and its hands and to be a mutual learner with other people. He pointed to links with ERCs in other parts of Oceania especially East Timor, PNG and most recently the Philippines. The members of the new Board John Staude (Chair), Pauline O'Connor, Michael Cole, and Kevin Paull were presented with plaques. Two additional members Bev Oliver and Maria Harries were overseas. Everyone contributed, by writing on a "post-it" note an idea for the operation of the centre. These were then displayed around the wall. Highlight of the ceremony was the solidarity dance where all joined one of three concentric circles to enjoy kinaesthetic communion with those present in support of others around the world working for peace and justice. There followed a meal and conversation under balloons, banners, flags (Aboriginal, Indian, East Timorese and WA) and the new website address (www.ercfremantle.org). 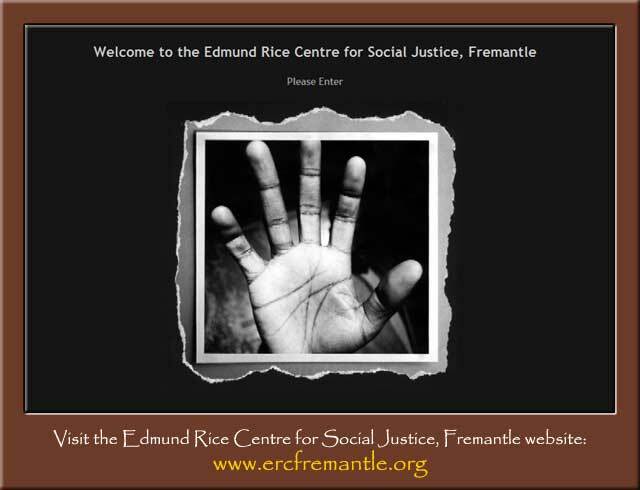 Individuals, teachers and parish and community groups who are interested in using the resources provided by the centre, or in participating in the programs being developed by the Centre are encouraged to visit the website at www.ercfremantle.org or contact Clare O'Connor on 08 9335 4353 or by email at: edmundrice.centre@cathednet.wa.edu.au. Report written by Br John Marks, Photos by Br Pat Kelly.